Ms. Fatihiya Ally Massawe is a Senior Lecturer, Researcher and Consultant working at the Department of Policy, Planning and Management, at the Campus College of Social Sciences and Humanities- Sokoine University of Agriculture (SUA). She holds a PhD in Rural Development from SUA and Masters Degree in Science in International Development Studies from Wageningen University, Netherlands. Fatihiya teaches courses in Poverty analysis, Conflict Management, Agriculture and Rural development and gender and development. She also has a vast experience in organizing and facilitating gender workshops and believes in organizational transformation. Fatihiya has been working in SUA’s Gender Policy Implementation Committee (GPIC) since 2007. She has been serving as facilitator in the committee and has conducted various awareness programmes and seminars for students and staff. As part of the Martha Farrell Memorial Fellowship, Fatihiya is working towards strengthening the GPIC of her university, so that all the staff and students become aware about the redressal mechanism available for them and fearlessly report instances of sexual and gender based violence in the university. Dr. Carmen Suneetha Wickramagamage - Dr. Carmen Suneetha Wickramagamage hails from the city of Kandy, Sri Lanka. 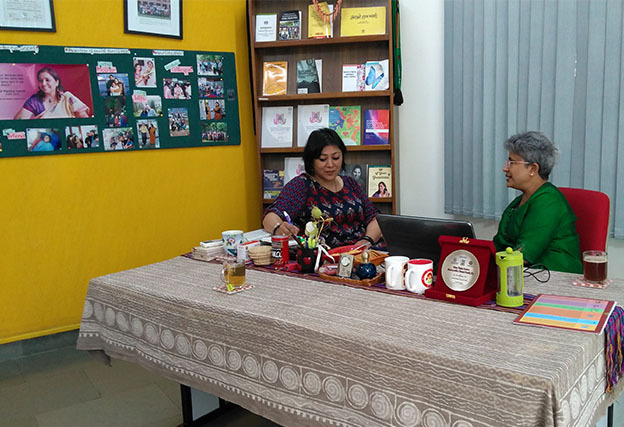 Currently a professor at University of Peradeniya, Sri Lanka, she has been teaching in the Dept. of English since 1985. She holds a BA in English (Hons.) from the University of Peradeniya and a PhD in English from the University of Hawaii at Manoa, USA. From 2002 to 2006, she was the Joint Coordinator of the Translation Studies Programme at her university and from 2004-2009, she headed the Department of English. She teaches courses on British and American Literature as well as Post-Colonial Literary Creativity. She has researched extensively on postcolonial literary studies and feminist literary criticism and authored many papers and books on the same. Dr. Wickramagamage is currently the Director of Gender Equity and Equality Cell at her home university. Since 2015, she has played an instrumental role in drafting a comprehensive anti-sexual harassment at workplace policy at her university and ensuring the implementation of guidelines laid down by the Standing Committee on Gender Equity and Equality (GEE) of University Grants Commission (UGC), Sri Lanka. As a part of this fellowship, Dr. Wickramagamage is working on the effective implementation of anti-sexual harassment at workplace policy in her university, which includes raising awareness and dispelling myths about sexual harassment at workplace (SHW), by facilitating effective dialogue and conversations among students, faculty and staff. She is also developing a paper, which will critically document the process of implementing the SHW policy among multiple stakeholders in the university. Mohammad Mojibur Rahman – Mohammad Mojibur Rahaman is currently an Associate Professor at Institute of Education and Research (IER), University of Dhaka, Bangladesh. In 2011, he completed his M.Phil from IER and holds Master’s and Bachelor’s degrees in Education. He has also worked as a Pogramme Officer in ActionAid, Bangladesh and written and published extensively on lifelong education, education for development, gender education and non-formal education. He is also the Founder-Director of Paathshala, a school for working children. As part of Martha Farrell Memorial Fellowship, Mr. Rahman brought about an active anti-sexual harassment policy in his campus. In Bangladesh, there isn’t a national law that provides for prevention and redressal of sexual harassment at workplace. Therefore, universities and educational institutions are also lacking in institutionalizing an anti-sexual harassment policy within their campuses. Mr. Rahman conducted a survey with students and staff to identify issues of sexual harassment within University of Dhaka and used the data thus gathered to inform the policy that he formulated for his university. In March 2017, he brought together management, staff and students to validate the policy and put it into action. Currently, University of Dhaka is leading the way for other educational institutions in Bangladesh by implementing a proactive and inclusive anti-sexual harassment policy.